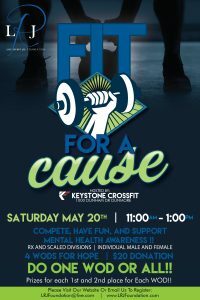 Fit for a Cause, hosted by Keystone Crossfit, 1000 Dunham Dr, Dunmore, PA, will be held Saturday, May 20, 2017, from 11 a.m. to 1 p.m. Compete, have fun and support mental health awareness. Rx and scaled divisions; individual male and female. Four WODs for hope. Do one WOD or all. $20 donation. Prizes for each first and second place for each WOD. Online registration ends May 7. Anyone interested in registering for the event after May 7 should email Lrjfoundation@live.com. All participants must print and sign a waiver to participate. Waivers will be available the day of the event as well. The event has ended. Registration is now closed.